For other people named Desiderius, see Desiderius (disambiguation). Desiderius (also known as Desiderio in Italian) (died c. 786) was the last king of the Lombard Kingdom of northern Italy, ruling from 756 to 774. He is chiefly known for his connection to Charlemagne, who married his daughter and conquered his realm. Born in Brescia, Desiderius was originally a royal officer, the dux Langobardorum et comes stabuli, "constable and duke of the Lombards," an office apparently similar to the contemporaneous Frankish office of dux Francorum. 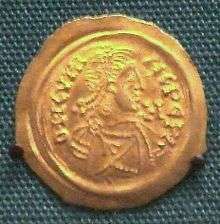 King Aistulf made him duke of Istria and Tuscany and he became king after the death of Aistulf in 756. At that time, Aistulf's predecessor, Ratchis, left his monastic retreat of Montecassino and tried to seize the kingdom, but Desiderius put his revolt down quickly with the support of Pope Stephen II. At his coronation, Desiderius promised to restore many lost papal towns to the Holy See, in return for the papacy's endorsement of his claim. Conflict with the Holy See under Pope Stephen III arose, for Stephen opposed Charlemagne's marriage to Desiderius' daughter. Desiderius ceased delivery of the towns after only a few. Seeking, like his predecessors, to extend the Lombard power in Italy, he came into collision with the papacy and the southern duchies. In the same year Desiderius associated to his kingdom his son Adelchis. Alboin, the duchy of Benevento and Liutprand, that of Spoleto were coaxed by Pope Stephen to commend themselves to the Franks and thus separate themselves again from monarchy. They then  placed themselves under the protection of Pippin, the king of Franks. In 758, Duke Liutprand of Benevento attained his majority and rebelled. Desiderius defeated him and granted his duchy to one Arechis, tying the duchy more closely to Pavia than it had been since Grimoald's time. In that same year, Desiderius deposed Alboin of Spoleto and exercised himself the ducal powers there. Intervening in the crisis that ensued after the death of Pope Paul I in 767, Desiderius seized a priest named Philip from the Monastery of St. Vitus on the Esquiline Hill in Rome on Sunday, July 31, 768, and summarily appointed him pope. Antipope Philip was never recognized nor gained a significant following, so he left the same day and returned to his monastery where he was never heard from or seen again. 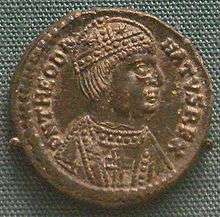 Stephen III opposed Charlemagne's marriage to Desiderius' daughter, Desiderata, in 768, but by his death in 772, he had made peace with the Lombards. The new pope, Adrian I, however, implored the aid of Charlemagne against him, for the marriage of dynasties was dissolved by Charlemagne's repudiation of Desiderata in 771. Charles sent her back to her father. Moreover, Gerberga, the widow of Charlemagne's brother Carloman, sought the protection of the Lombard king after her husband's death in 771; and—probably in return for the insult Charlemagne had given to the Lombards by rejecting Desiderata—Desiderius recognised Gerberga's sons as lawful heirs, and attacked Pope Adrian for refusing to crown them kings and invaded the Pentapolis. The embassies of Adrian and Desiderius met at Thionville and Charlemagne favoured the pope's case. Such was the position when Charlemagne and his uncle Bernard led troops across the Alps in 773. The Lombards were severely defeated at Mortara (Ara Mortis) and soon besieged in their capital of Ticinum, the modern Pavia. 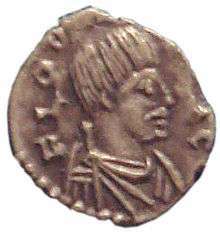 Desiderius' son Adelchis was raising an army at Verona, but the young prince was chased to the Adriatic littoral and fled to Constantinople when Charlemagne approached. The siege lasted until June 774, when, in return for the lives of his soldiers and subjects, Desiderius surrendered and opened the gates. Desiderius was exiled to Corbie Abbey, where he died, and his son Adelchis spent his entire life in futile attempts to recover his father's kingdom. Some sources state that the king and his family were banished to a monastery at Liège, Belgium. Desiderius died sometime around 786. The name Desiderius appears in the romances of the Carolingian period. Charlemagne took the title rex Langobardorum, the first time a Germanic king adopted the title of a kingdom he had conquered. It should be noted however that, as stated by Paul the Deacon in the Historia Langobardorum, Charlemagne's father Pepin the Short was formally adopted by Lombard king Liutprand, thanks to the alliance, and personal friendship, between the latter and Pepin's father Charles Martel. This fact would have later legitimized both the ascent of Pepin to the throne of the Franks, as he was already the son of a king, and the claim of his son Charlemagne to be the King of the Lombards. Wikisource has the text of the 1911 Encyclopædia Britannica article Desiderius. ↑ Reardon, Wendy J. The Deaths of the Popes. Comprehensive Accounts Including Funerals, Burial Places and Epitaphs. McFarland. p. 59.